Lifelong Johnston County resident Steve Bizzell announced today (Thursday) that he will seek a sixth term as Johnston County Sheriff. 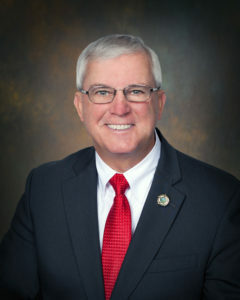 Bizzell was first elected in 1998 after serving under two former sheriffs and he has become one of North Carolina’s longest-serving elected county sheriffs. Sheriff Bizzell served as President of the North Carolina Sheriffs’ Association (NCSA) in 2007-2008 where he represented all 100 sheriffs in the State of North Carolina. He held the position of Chairman of the Executive Committee of the NCSA from 2008 to 2009 and continues to serve as a board member. In 2014, Sheriff Bizzell was selected by Governor Pat McCrory to serve on the Governor’s DWI Task Force and was elected by sheriffs in District 4 to serve on the N.C. Sheriffs’ Education and Training Standards Commission. In 2016, Sheriff Bizzell received the “Order of the Long Leaf Pine,” among the most prestigious awards presented by the Governor of North Carolina. Johnston County is projected to be the fastest growing county in North Carolina percentage wise over the next 10 years and will surpass 200,000 residents this year. Great sheriff! You got my vote!